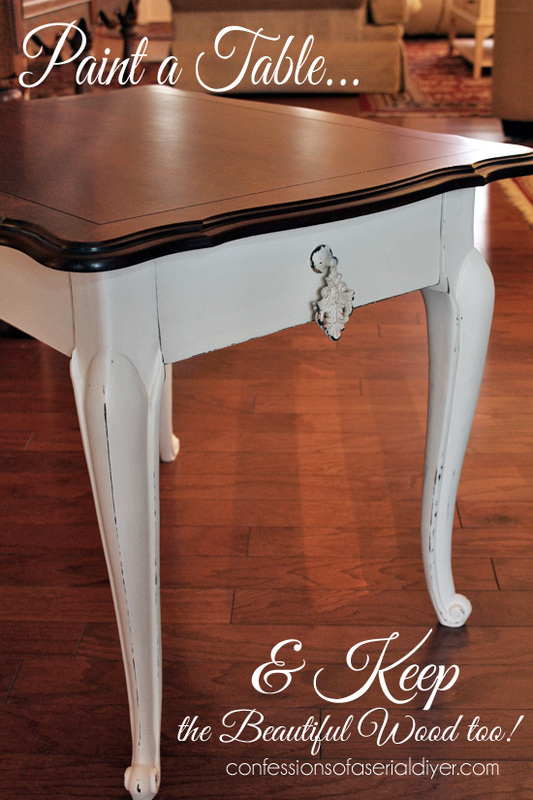 Paint a Table & Keep the Beautiful Wood too! Day #18 what?? How did we get here so fast? 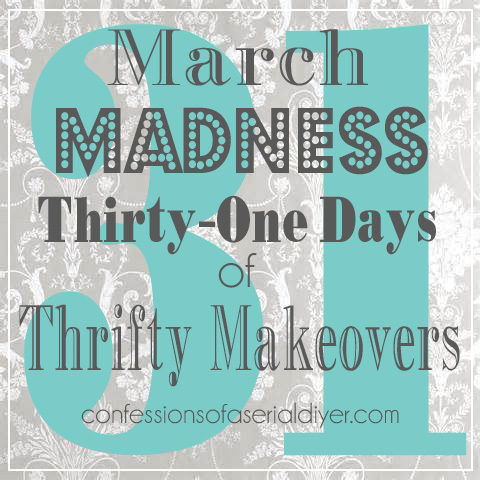 If you are just joining our little party, we have been enjoying a thrifty makeover every day so far this month as part of my March Madness, 31 Thrifty Makeovers in 31 Days series! 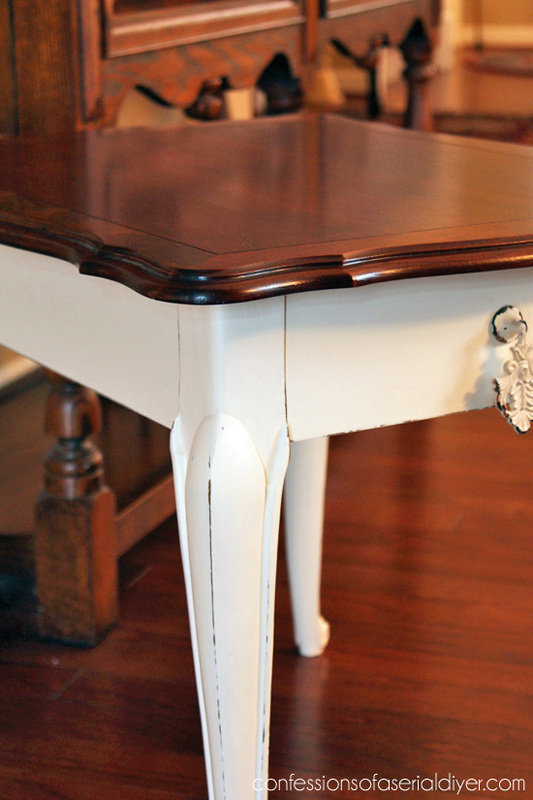 I love French Provincial anything and this had those pretty curves. It was marked $39.99. Too much, where’s that man that offered to make me a deal? He ended up letting me have it for $25. That’s much better! Forgive the photos. I had grand plans of taking really cool photos on the train tracks behind the antique mall where I have my booth. Unfortunately (& out of nowhere) it started raining on my way there. I was so bummed, so I ended up taking these at my Parent’s house since I was heading there first. That’s also why the lighting is so dull…the blasted rain! Maybe some day I’ll get a beauty shot on the tracks. 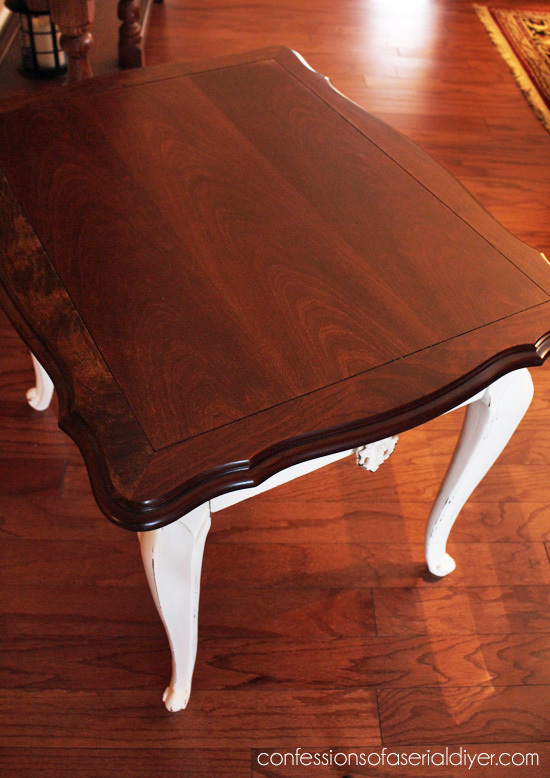 The stain I used is Dark Walnut by Minwax. I followed it up with two coats of Minwax Polycrylic that I applied with a foam brush, sanding lightly between coats. 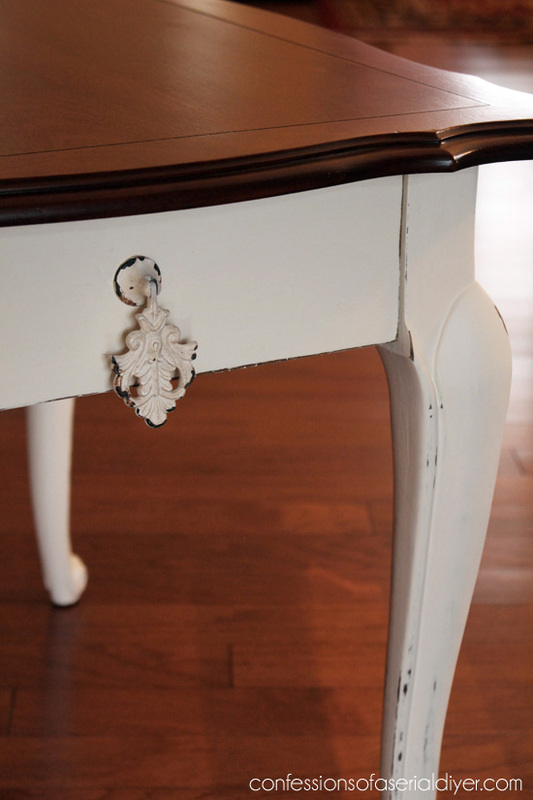 I used my DIY chalk paint in Cottage White by Behr to paint the legs. The pretty pull came from Hobby Lobby. 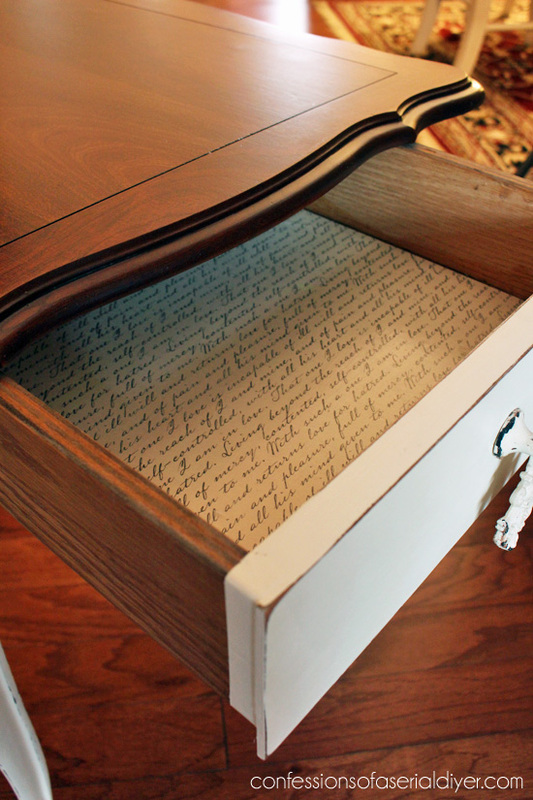 The drawers got a pretty new lining too with the help of Mod Podge. See how easy that is to do here. Painting just the legs is a great way to revive a piece while maintaining the beauty of the wood on top. I spent the weekend at my Parent’s house last weekend redoing their bedroom set as a surprise while they were out of town. I can’t wait to share that with you! 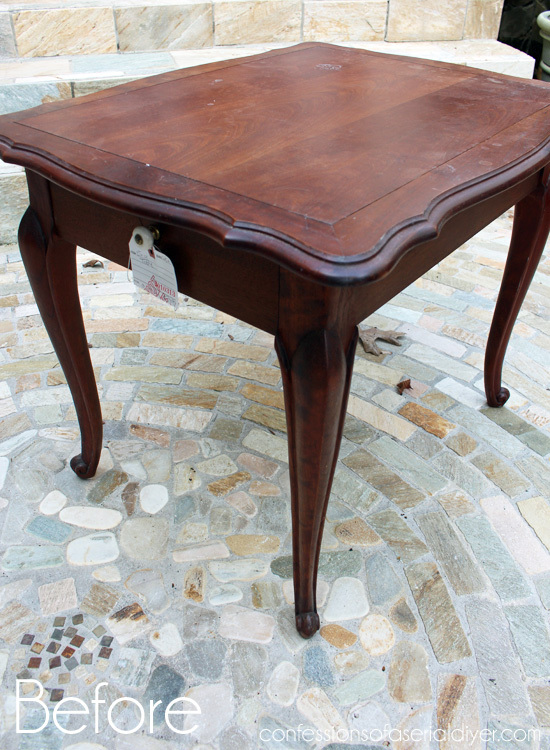 The table is a beauty…now!!! I hope your parents wanted a re-do on their set…..OR that really will be a surprise!!! Come over and surprise me!!! I was introduced to your blog via Pinterest about three weeks ago and have remained curious but quiet. Well, this BEAUTIFUL redo made me open up to let you know that I think so much of what you do is absolutely amazing! The eye and imagination and creativity you have is truly inspiring! I’ve become quite addicted to your blog and can’t wait for the next post! You are a DIY Genius 🙂 Thank you for giving us the inspiration to expand our own creative nature. Many blessing to you and yours! That’s really beautiful Christy. Tracks would have beautiful. Maybe the heavens will open up for your next shoot! You did an amazing job on the little French table! The little pull from Hobby Lobby is perfect on the drawer. I love it! Beautiful makeover Christy! 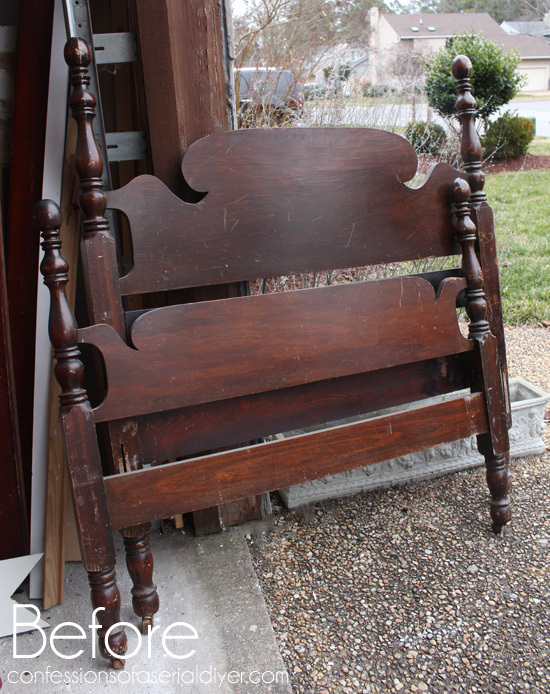 Minwax Dark Walnut is the best, especially with white. I bet this is another piece that will sell quickly in your booth. 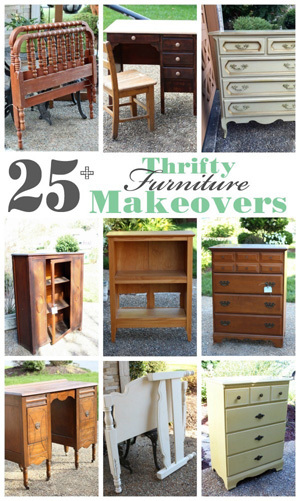 Looking forward to seeing the makeover you gave your parent’s bedroom set. Hi Christy. I just wanted to tell you how much I am enjoying your 31 days of makeovers. It has been so fun following along with you. And it is inspiring me to finally do something with all the treasures I have brought home over the years that have just been sitting un- made-over! 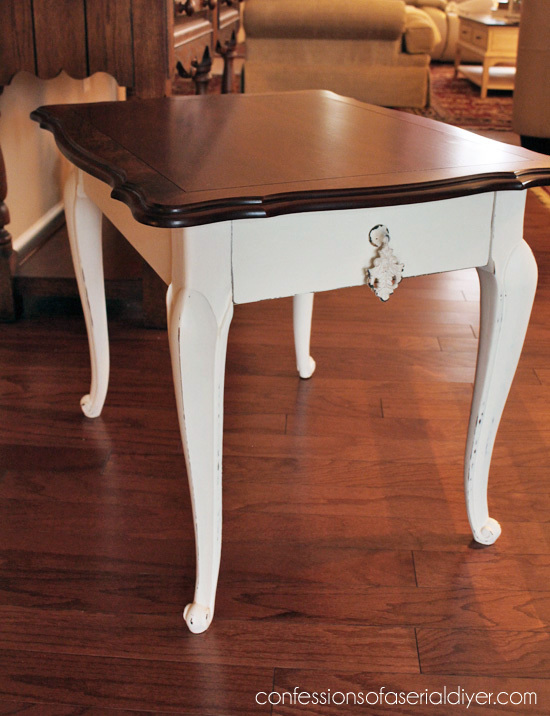 The dark walnut stain sets off the white legs to perfection! 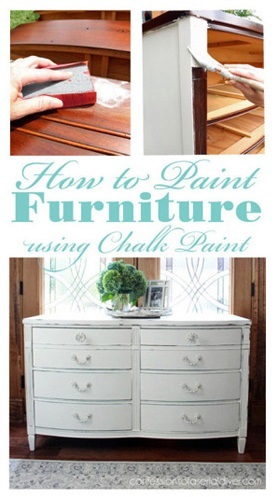 I’m glad you chose to paint the table this way—and, I love the drawer pull. Wish Hobby Lobby was much closer to me than it is–I’d be there several times a week, I’m sure! Love that place! Looking forward to seeing your parent’s bedroom furniture next week. Hi Christy! Love this little table :)! It’s adorable~~~~as always you are so inspiring. Thank you! Another gorgeous makeover! I’m so glad you decided to keep the wood top…looks amazing. I can’t wait to see your parent’s bedroom makeover. 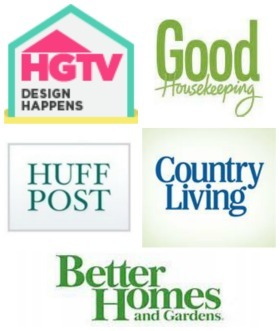 This has been such an amazing March on your blog! I love this look!!!!!!! Great re-do 🙂 I am really enjoying your daily Post’s this month…Already looking forward to tomorrows! Gorgeous as usual. Your work never disappoints. By the way, I love the white pillow you made too! Beautiful makeover! 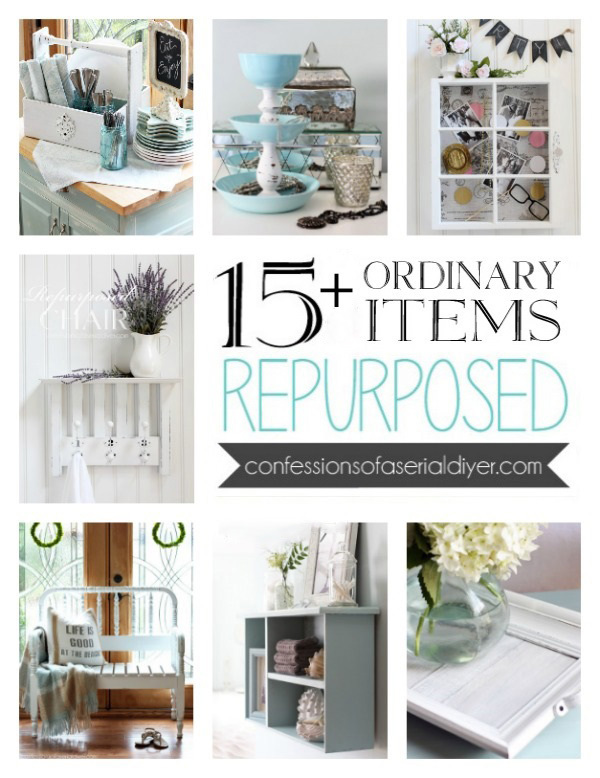 I’m addicted to your blog and can’t wait for each new makeover. Each makeover is very inspiring. I just might have to go thrift shopping soon!! Beautiful. Very nice job! 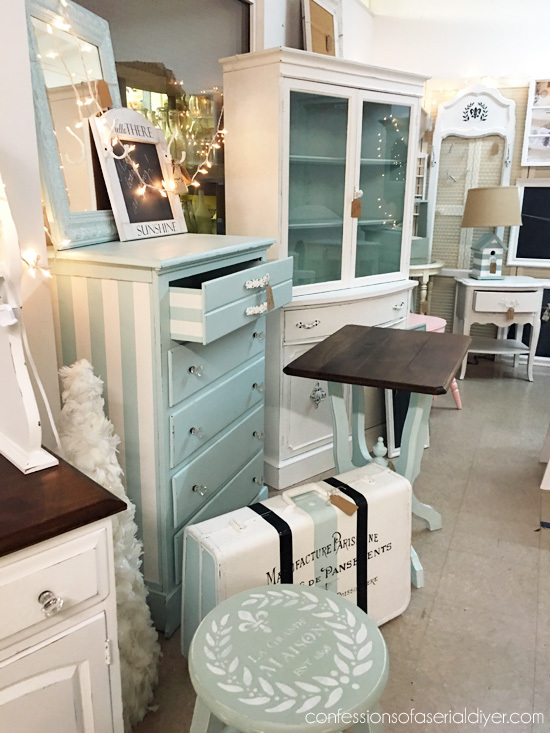 The many things you do to furniture and other objects are inspiring. I wish I would be more open to starting a project. I need to get over my fear of messing the projects up. I need to just do it! Really well done. You brought the top back to perfect condition. Now this piece is simply exquisite! What a great finish you achieved on that top. Wow. I just love this. My all-time favorite look…stained top, painted bottom! !